People often ask, why is engine coolant and antifreeze important? Can’t just water keep the engine cool as well? The answer really relies on where you live. Many places around the globe don’t see lots of snowfall or weather dropping below the freezing point. Places like those, it’s fine to use water in the radiators of the cars. But still, it isn’t as simple as that. But do all antifreeze coolants perform the same? The short answer is no. Each brand has its own compounds in the making of these coolants and each comes with a different proportion. So here we are, with a list containing the names of the best and well-known brands there are which make engine coolants and antifreeze. 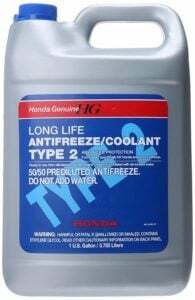 Find the best engine antifreezees & coolants! Some vehicles use special antifreeze for the car model and you should always check with your authorized dealer or repair manual to know which antifreeze you should use. Doesn’t mix Ethylene and Propylene coolant. If you want to learn more about different coolants, check our FAQ section at the bottom of the article first. Scroll down or click here. Prestone is a well-known name with quality products made for cars. One of their products is coolant and antifreeze for the engine. 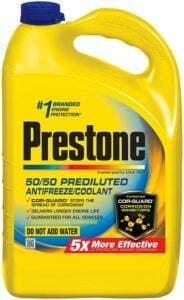 Undoubtedly, Prestone makes one of the best quality engine coolant which ensures you that your engine has the best coolant liquid in it and won’t let it overheat other than preventing itself from freezing. 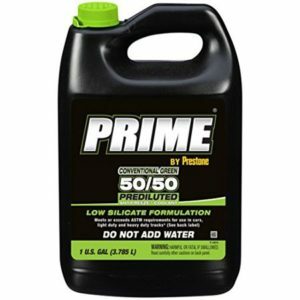 Prestone claims their fluid can stay fresh for up to 5 years of use. The compounds inside the coolant stay intact for up to 5 years before the liquid needs to be replaced. With Prestone’s AF2100, you don’t need to worry about the mixing or dilution proportion of it. The coolant comes pre-mixed with 50 per cent water and 50 per cent coolant. The fluid can stay intact for up to -34 degrees which is suitable even in the coldest areas around the world. This liquid also helps to fight particles in your car’s radiator and prevents corrosion inside it. This coolant is compatible with all different car models and all different coolants. Prestone also helps to keep safe the seals and other parts made of rubber where it circulates. Staying fresh for over 5 years. 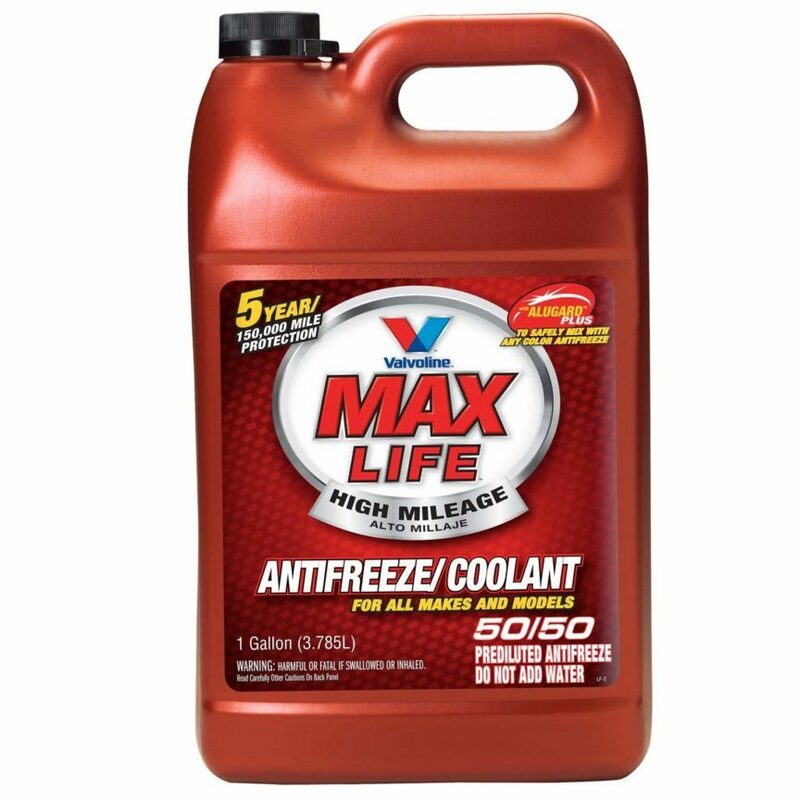 Maxlife by Valvoline will prove to be a conventional coolant and antifreeze for your car as it works to keep the engine cool in cold temperatures. Besides that, Maxlife coolant will help lubricate the internal seals and parts which the liquid comes in contact with. You can use the MaxLife coolant with all different car models and it is claimed to be compatible with the most different coolants on the market. The Valvoline Maxlife does also protect and lubricates the seals and gaskets in your coolant system, which may prevent your car from having coolant leakages. 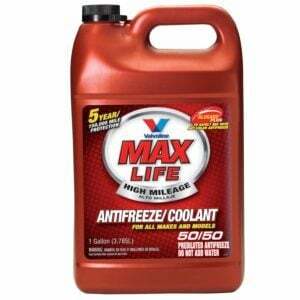 The MaxLife coolant is holding over 5 years and that makes it a good coolant. Coolant replacement can be really difficult to do it by yourself if you do not have the required skills to do it. The bleeding process after a coolant replacement can be really difficult and with a coolant that can hold for a longer time, you do not have to do that as often as with a regular coolant. Havoline is known for making high-quality fluids such as engine oil and other related products. 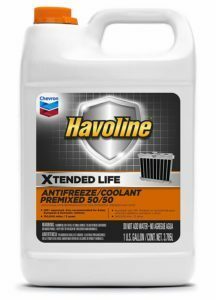 They also make one of the best quality engine coolant and antifreeze like this one – Havoline Xtended Life. We can safely say that coolant from this brand can be used with any vehicle with ethylene coolant and perform a 100% result. The compounds in the liquid contain no silicate, keeping your engine cool and running smoothly in the winter. Recommendations by Havoline states that you should change the coolant after driving more than 150,000 miles. It’s worth mentioning that this is an ethylene coolant, as with the most of the other coolants here and these should not be mixed with propylene coolant (Used in older cars.) Overall, this coolant is compatible with the most cars on the market with ethylene coolant. The coolant comes 50/50 pre-mixed with water. Which means that it’s ready to use in your vehicle and you do not have to mix it with water yourself and risking any damages to your vehicle, from the wrong mixed coolant. 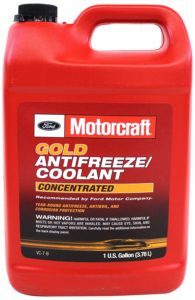 This is Ford’s own coolant and antifreeze provided for Ford vehicles which gives Ford owners an instant assurance that the quality of the product will be of high quality and comply fully with Ford cars. This fluid will keep your Fords running cool and prevent corrosion in the radiator. Although, many modern cars now come with radiators made up of strong plastic which solves the issue of corrosion and rust permanently, for those with older model Fords, their radiator will get a thorough cleanse when this coolant is poured into the radiator. But keep in mind that the engine can still cause corrosion inside the engine and a proper coolant is always recommended. Ford’s fluid has a distinct colour, being yellow and work best with both, diesel engines and gasoline. This coolant comes in a concentrated format, which means that you have to mix it with water yourself before filling up your coolant system. Always make sure that you mix it with 50/50 water and coolant, because another format may cause your car to freeze or overheat faster, and you do not want that. The good thing about this is that you do not buy 50% water in the package, if you buy 1 gallon of concentrated coolant, you will get 2 gallons of ready to use coolant. The Valvoline Zerex G-05 is a high-quality coolant that is aimed to be used in high-quality radiators made with aluminum. It is special for such radiators as it features a special technology called HOAT. This contains special hybrid compounds which help to prevent corrosion and rust in aluminum radiators. It also keeps the engine cool and can hold its state for up to -30 degrees. This coolant is made with low silicate amount and is completely phosphate free, making it more powerful. All that helps in preventing water body failures and keeps the engine running at an optimal temperature. You do not have to be afraid that this coolant will hurt your engine. Will does not harm hoses or other parts in your coolant system. This coolant is from a well-known car manufacturer Audi. Again, I don’t have to tell you how good this coolant is. The fact that it’s made by Audi should say that. It is primarlity intended to be used with Audi, Volkswagen, Skoda and Seat vehicles, but can be used in more cars(Check with your authorized dealer or in your repair manual). It works best to keep the Audi engines and other Volkswagen engines running cool and smooth, keeping the radiator and water body fresh in the process. Note that the G13 from Audi doesn’t come mixed with water from the shop. You will have to do that. But is it’s advised to perform the mixing after checking the coolant bottle first. This product obviously complies with the radiators and water bodies and thermostat sensors present in the Audi and Volkswagen engines. Make sure you mix the coolant properly with 50% water, because a faulty mixing, may cause your coolant to freeze or boil and cause serious damages to your car. Although it’s made by Audi, it can be used with other cars too but it’s really just the assurance that it’s made by Audi, otherwise, it will only do as much as keep the engine cool as the special compounds in it are made specifically for the radiators used in Audis and Volkswagen. Honda’s coolant contains ethylene glycol which protects all the aluminum parts inside your car’s radiator. Honda’s coolant is high quality but has quite a low life compared to other similar products. The coolant stays good for use for a total of 3-4 years. In terms of mileage, the liquid compound will stay fresh for 50 to 60 thousand miles driven. This coolant comes Pre-mixed with 50/50 water and glycol, which is ready to use in your vehicle. But one thing about Honda’s coolant, like Audi’s coolant or any other branded coolant is that it doesn’t come cheap. So if you have an older model car and you have a tight budget, it’s better to go with the cheaper alternatives. 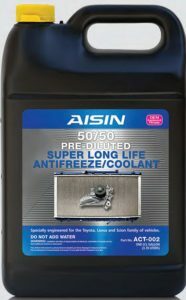 Aisin coolant is like any other coolant that is budget friendly. Aisin’s ACT002 comes mixed from the factor so you don’t need to worry about mixing it with water yourself. Also, the liquid is a long life so it will have you going for a few years before you need to replace it with new coolant. The ACT002 is made especially for Toyota vehicles but it works just fine with Toyota’s subsidiaries like Lexus. But this coolant should work with just about any vehicle and serve the basic purpose of being a good engine coolant. It’s compatible with the most Asian cars on the market, but always make sure before adding it to your vehicle. You can find information about this in your car repair manual or you can call your authorized dealer to ask them. Can be used in other car models also. The Green silicate is just as good as its AF2100 product. It comes mixed from the factory. The liquid contains ethylene glycol which will help prevent corrosion and rust in your radiator other than keeping the engine running cool. This product retains the heat for up to -34 degrees so that your coolant troubles end here. This liquid will also help to lubricate the seals and other internal parts inside the waterbody and radiator. This coolant is Aluminum compatible and can be used in most car models. 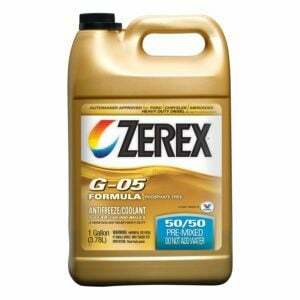 The coolant comes pre-mixed with a 50/50 mix of water and glycol, ready to use in your vehicle. This product is currently out of stock on Amazon, so if you want to buy it, you have to check on other websites on the internet. Use google to find it is my recommendation. This product is the last one on our list, and it’s not a coolant as the other ones in this list. Why we wanted to include this is to give you an alternative if you want to seal your coolant system from leaks. The K-Seal is made keeping old cars into consideration. It will cover the problems faced by old vehicles and their radiators. What makes this liquid different is that it will permanently fix the minor issues in the radiator such as minor leaks and the likes. 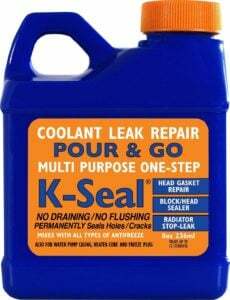 That way, you don’t have to spend too much on the repairs on your old cars and easily get off with a cheaper alternative such as K-Seal’s permanent coolant. It even goes as far as fixing the minor leaks and cracks in your car’s water body, heater, engine head so that really makes it up for lots of costly repairs. The liquid contains microfibers which start to clog and heal the cracks and leaks immediately as the liquid circulates throughout these and the whole system. But let’s not forget its primary purpose. May fix head gasket leaks (If it’s not too bad already). As you maybe already know, the purpose of the coolant is not only to raise the freezing point. The purpose of the antifreeze is also to keep away rust from the inside of the engine and lubricate the moving parts in the coolant system like the water pump and thermostat. If you have tried to run your vehicle with only water, you did probably notice that the water gets brown really fast, and all that is rust from the inside of your engine. The engine antifreeze does also raise the boiling point, which makes your vehicle to not overheat as fast as with just water. This becomes quite simply in places where it gets freezing. In such areas, water is no option. As the temperature drops, the water will freeze inside the radiator and the water body and ruin those components. Other than that, it will simply overheat your engine as there is no liquid to transfer the engine heat too. Difference between Coolant or Antifreeze? Coolant? Antifreeze? Are these two things different? No longer. These two things are the same things and you can use both terms when you go in the market to get one for your car. In earlier times, these two were different. 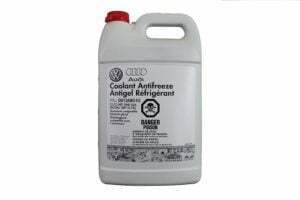 The antifreeze was made to be used with the coolant or water in the radiator. What that did was, had the antifreeze blend in with the cooling liquid in the radiator so that in the cold areas or under freezing temperatures, the antifreeze compound wouldn’t let the liquid in the radiator. To make it simple, these two things came in separate bottles and would need to be mixed accordingly to keep the coolant from freezing in cold temperatures. But now, with the help of special compounds and blends, these two things come in a single bottle relieving you of the hassle of having to mix them yourself. So can you just directly pour in your radiator? It depends on the brand. Some companies sell ready products so all you have to do is simply pour it in. Some brands provide the liquid in concentrated form so you’ll have to take some time to properly dilute it with water. How long before I need to change the antifreeze coolant? A common rule is to change or replace your engine coolant is after driving your car for about 50 to 60K miles but that depends on a number of factors like your car’s make and model. Yes. Every engine is made differently in terms of performance and efficiency. An engine which is bigger and has more cylinders will heat up quicker than a car with a smaller engine. But that car will also have a bigger radiator and a powerful waterbody. So it depends on the vehicle type as well as the antifreeze coolant. As these liquids are made with special compounds, these lose their integrity after some time and that’s when it needs to be changed and replaced. The recommended time range is between 3-5 years between the coolant replacements, depending on the coolant. Check in your repair service manual to be 100% sure or check with the last coolant you added to your vehicle. If you are not sure which coolant you have in your car, the easiest way is actually to replace it with one that you know is good and fresh. Coming to the coolants, there are different brands with the different techniques used in their coolants. Some brands claim that their coolants can work 100% for 50,000 miles, while some claim for as high as 150,000 miles. One thing to consider besides that is that coolants now provide more benefits other than just keeping the engine cool. These features are lubricating the seals and rubber parts in the radiator and waterbody of an engine, keeping these parts from rusting and corroding and as such. So that factor also counts in the life of a coolant. A coolant may lose its integrity quickly in an older model car with an already rusted radiator whereas, in a new car, the coolant may last for as long as it’s manufacturers claim. Also, if you happen to use your car for great distances, it is advised that you change the coolant as per the advice of the coolant manufacturers and your car’s owner manual. After the coolant replacement, you have to bleed your car carefully. This process can be pretty tough to do yourself if you do not have the skills for it. If you want to learn a bit more about this, check out overheating coolant article here: Overheating Coolant system. Which antifreeze should I buy for my car? The best bet is to refer to your car’s owner manual before you go out to get the coolant for your car. The manufacturers of your car will best know that which type of coolant your car needs and benefit the most from. You can also call your authorized dealer to get your question answered fast. Remember to not mix propylene and ethylene coolant. If you choose the first prestone coolant in this article, you can mix it with all different coolants. Antifreeze for different types of engines? As the gasoline engine runs differently than diesel engines, the parts and oil also differ. Petrol engines tend to get a bit hotter than diesel engines and because of that, vehicles with a diesel motor are susceptible to rust and corrosion happening on the internal engine parts. For that purpose, antifreeze liquids for diesel engines and made differently to comply with the requirements of diesel working and similar, antifreeze for gasoline. Mix your coolant for higher boiling point if you have a petrol engine. Should I use Ethylene glycol for my car? It is extremely important to know if your radiator can handle a particular antifreeze coolant you are getting or not as it can cause problems. Some car manufacturers make their cars equipped with radiators which can handle ethylene glycol. Some are sensitive to it due to the materials in making the radiator. So it is highly advised to check your car’s owner manual on which coolant your car initially came and which coolant types are friendly with your car and can be used in your radiator without actually damaging it further. Some vehicles use aluminium blocks, and in this case, it’s also very important to use an ethylene glycol. Don’t take any risks, check your car repair manual before purchase. How much water should I mix my coolant with? If the coolant comes pre-mixed, use it as it is and don’t mix it with more water. This point is important as it determines if the coolant you have bought for your car is good enough for your car and the temperature in the area or state you live in. Your car’s temperature will work as per your radiator’s efficiency and the efficiency of the antifreeze coolant itself that you prefer to use. That is to say, choose the coolant wisely as some coolants feature a low-temperature. For instance, the temperature where you live drops constantly below the freezing point, the coolant needs to be able to retain enough heat so that it doesn’t freeze. If you live in warmer countries, you may not have to mix the coolant with a high freezing point as one in a cold country, but it’s always worth doing it in my opinion. What happens if you use only water in your car? As we discussed, water can work in places where the temperature doesn’t get that cold or drop below the freezing point better. But do note that while water may get you going fine for a few months, in the long run, your car may suffer permanent damage. Water will cause corrosion and rust inside the radiator and waterbody. Running on water may also cause your vehicle to overheat faster if you have problems with it from the beginning. Now that you have gone through our list, you know that many brands offer their coolants pre-diluted without needing you to mix it yourself with water. Some manufacturers, like Audi and Honda, don’t sell their coolants pre-mixed, rather they are concentrated so that if your car’s owner manual has explicit instructions regarding the use of coolant, an owner can accordingly mix water with the coolant. Also, these instructions are usually present in the coolant bottle. If not, a small instruction manual is given with the bottle which states the mixing proportions so you don’t have to worry about mixing it wrong. It is highly recommended to always try to buy high-quality antifreeze. That is why you need to use the excellent antifreeze you may purchase on your vehicles cooling device. There are in order that many benefits to doing that. Antifreeze isn’t always an expensive product in the market and it isn’t always worth it to try to save some money and which can have you to replace or restore an engine that has badly overheated or seized up; the cost alone for this restore would be exceeding the value of the car in some cases. Your best bet is to find that antifreeze or the brand that features all those things which your car’s owner manual requires or the similar. That way, you’ll simply be on the safe side such that your product is compliant with your particular car. Use the purchase guide we offer for you in the antifreeze opinions as a reference when shopping for antifreeze as with this knowledge, you won’t be making the mistake of getting the wrong fluid for your car. Without antifreeze, no engine will run for long under very hot or extremely cold situations. Oils would lose their viscosity and become so thin they could no longer do their process and once metal begins hitting different unlubricated steel inside the combustion chamber, engine failure will be imminent and you will have no choice but to have the engine rebuilt. Have you tried any of these coolants and want to leave your own review? Comment down below and I check your comment and answer you as fast as possible. If you would like to add any product to this list, you are welcome to contact us at our contact page.